EnviroSlopeTM Wire Mesh Face is an economical system to create attractive vegetated reinforced soil slopes and is recommended for slopes up to 70 degrees. The facing material for this option is wire mesh panels (forms) backed with a turf reinforcement mat and UV resistant biaxial geogrid to retain the topsoil at the face. The facing may be stepped back or alternatively fabricated with a slope as required to create the slope angle specified. The dimensions of the panel section are nominally 450 mm high X 3000 mm long per panel measured on the slope. Uniaxial geogrid (Layfield T Series or Layfield uniaxial E'Grid geogrids) are installed for slope stability. 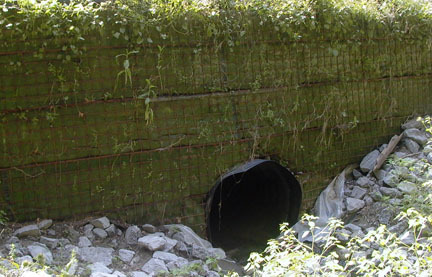 Reinforced slope structures are usually constructed in areas to save space. Typically the structure delivers advantages in right of way and reduced space that could not be achieved with the slope of an unreinforced embankment. Applications include highway embankment construction, vegetated permanent steepened slopes, industrial applications, arch culvert end treatments, and many others.